It took me a month to read this book. I’m the type that finishes books in a couple days, even ones I don’t like. I usually finish pretty quickly because I give myself the ‘at least it will be over soon’ pep talk. The problem with The 5th Wave was that it would not end. I couldn’t give myself any kind of pep talk because after 2 weeks I was barely at the half way point. Another thing about me? I’m stubborn. Even though I was tempted to DNF I kept telling myself, you made it to the halfway point keep going! So it took me a month to read The 5th Wave but I did eventually finish. I want to tell you because it took so long that everything about this book was terrible. But honestly, it wasn’t all bad. There were portions of the story I enjoyed but other parts. Well…those were bad. Let’s start with the good. I really liked Cassie, she was a survivor above all else and I could relate to that. I think that is how I would be if the world was ever coming to an end. She wasn’t trying to be a hero she was just trying to take it day by day. I also liked her steadfast dedication to finding her brother, and the relationship that develops between her and Evan. Actually, the only parts of the book I enjoyed were those chapters dedicated to Cassie. What I wasn’t prepared for when I started The 5th Wave was 1. All of the backstory right in the beginning. The first 100ish pages was just back story. The back story was interesting but boring to read all condensed like that. 2. The shifting narration. After 100+ pages we got a new narrator. Then we got a third. Then I really lost interest. Over half way through, on the second narrator I think, The 5th Wave took a turn for the Ender’s Game. I thought the mention of Ender’s Game in the synopsis was just warning, “Here There Be Aliens”, but no. 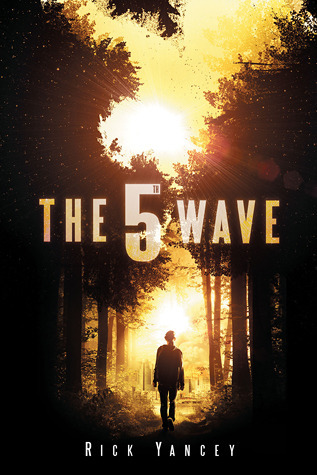 The basic plot of Ender’s Game (child soldiers, alien fighting, lies) was thrown in to The 5th Wave. This plot made up much of the latter half of the story. I loved Ender’s Game but seeing it re-written and folded in to this story left a bad taste in my mouth. The 5th Wave could have been half as long as it was, done without 1 or 2 narrators, and been a better story for it. The premise is interesting and I did enjoy the portions of the story narrated by Cassie. It was a very ambitious novel and, for me, all that ambition never morphed in to something I could enjoy. If you ever wondered what it would look like if The Host and Ender’s Game had a love child then you should read this book. I did felt the same way. The first half of the book was boring then the shifting of narrators. The only thing that I like about this book is Cassie and Evan. I'm curious with the alien race too and how Evan will play along the war between human and his race. I agree with you on everything but Cassie. I really didn't like her. xD But everything has differing thoughts on books! I'm pretty neutral about the child fighting since I haven't read Ender's Game. The only thing I really didn't enjoy about the book was the style. The pacing, the POV shifting, the whole bit. It was just slow, and the POV changes didn't help. This I wholeheartedly agree with you! And I hated how nothing was really a surprise. I guessed half of the book within the first 100 pages after Cassie's "backstory" was happening. That wasn't fun either.